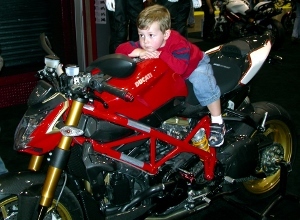 As the riding season in the Northwest comes to a close, there is one final event that is a must for every motorcycle enthusiast; The Seattle International Motorcycle Show. With all of the major manufactures showcasing their newest models and latest technology, dozens of exhibits and the Sound RIDER! annual Northwest Motorcycle Exhibit, featuring more than 30 unique and custom motorcycles, you can count on an action packed, event filled weekend. Running November 21-23, at the Washington State Trade & Convention Center in Downtown Seattle, tickets start a $12.00 and there are a number of discounts available from local dealers. Chief Sponsor Progressive Insurance, will be a mainstay at this year’s International Motorcycle Show and the “Garage” will be featuring fun for the whole family. In addition to having several agents on hand to answer your motorcycle insurance questions, The Progressive Garage will have a huge slot car racing track for the kids, a tank painting exhibit and live T-shirt screen printing. Chances are, if you’re heading to the show it’s because you’ve got a little “gear head” in ya, in which case you’ll be right at home at the J&P competition. 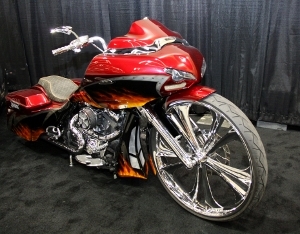 With over $77,000 in prizes, custom works from the country’s best builders will be on display. Be sure to stick around on Sunday afternoon for the Ultimate Builder Awards Ceremony. As always, the IMS Market Place will be featuring the latest in aftermarket parts and accessories from top brands like Shoei, Coretech, Tourmaster, Performance Machine, Vance & Hines and many more. An afternoon of browsing at this year’s show and you’re sure to be inspired to upgrade your own gear and machine. The Market Place has got you covered. The Puget Sound has many vintage motorcycle enthusiasts and you can look forward to seeing some of the best classics in the area on display. We all love modern, performance driven technology, but it’s hard not to be impressed by the rugged, utilitarian designs of the past. A can’t miss for any motorcycle fan. With 15 years under tire and in publication, this year’s International Motorcycle show marks an unofficial milestone for us here at Sound RIDER! We’ll be celebrating with huge deals in the Sound RIDER! store on apparel, essential gear and books. Speaking of books, be sure to stop by the SR! booth on Saturday between 1 and 3 for a very special book signing with motorcycling legend and Sound RIDER! contributor David Hough! above: This masterpiece by Keith Wong of Zacky's Custom Rods was displayed at the previous Seattle show. Have you got a bike that needs to be in our exhibit? There is never a time of year they don’t have enough canned food on hand. Stop by our booth with a can of food or two for Northwest Harvest and get a special gift from Sound RIDER! for your canned food donation. As mentioned above, we’ll be displaying more than 30 of the Puget Sound’s most unique and impressive motorcycles as part of our annual North West Motorcycle Display. Have a bike that you think can make the cut? Good news, we still have a few spots left! Head over to www.soundrider.com/ims to submit your ride and if your bike is selected, we’ll set you and a friend up with FREE weekend passes! above: One of the only places to ever see a land speed racer is in our annual exhibit. At least one of these will be on hand this year. Can you guess which one? Free Motorcycle Parking – Once again there will be free parking if you ride your motorcycle. Space is limited so arrive early to get a free spot.